Sellers are downsizing to condo which creates YOUR opportunity! This meticulously cared for one-owner ranch with walkout lower level is ready to care for its next family. 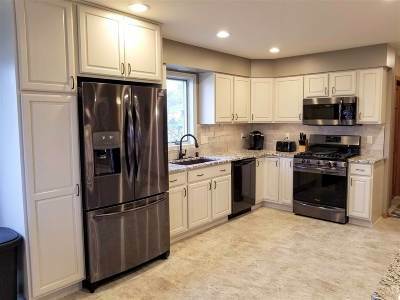 Open area Kitchen and living room updated in 2017 with Granite, black stainless appliances, luxury vinyl tile and lighting. Enjoy and the views and entertain from the massive deck, updated with Trex flooring. Many other features and updates listed in the Associated Documents. UHP Elite Home Warranty adds to your peace of mind. Don't miss your chance at this diamond! Sellers are licensed real estate agents. Directions: Cth T/Commercial Ave To North On Eagle Crest Dr. Items Included: Stove, Fridge, Beverage Fridge, Microwave, Dishwasher, Washer, Dryer, Fridge In Ll, Water Softener, All Window Coverings, Shed.